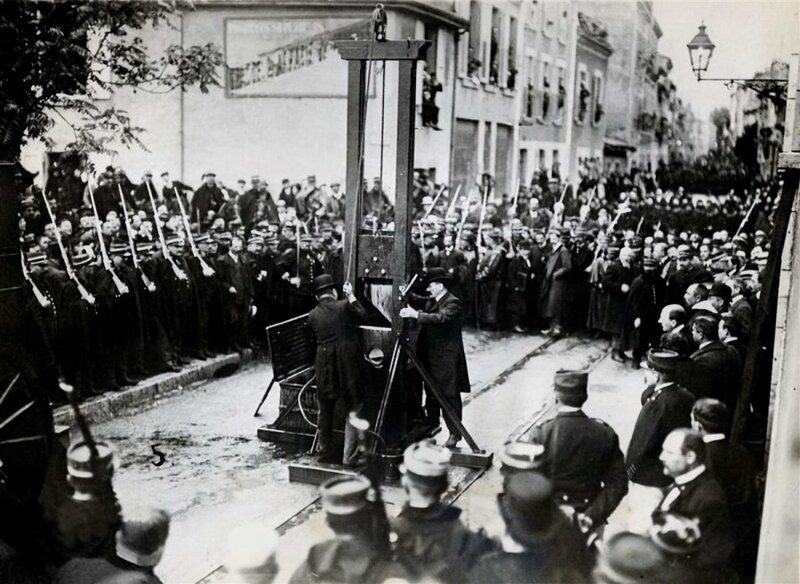 The last person publicly guillotined in France, Eugene Weidmann was born at Frankfurt-am-Main in Germany on 5 February 1908. A career criminal, he led a gang of teenage thieves before moving to Paris and progressing to more serious crimes, including six murders. He stole cars and, while on test drives, would shoot the owners in the back of the neck. He also strangled one victim. He was arrested on 8 December 1937 after a shoot-out at his home in St Cloud. When asked if he had any remorse for his victims, he replied, “Remorse, what for? I didn’t even know them.” He confessed to police that he and his confederates had planned to kidnap wealthy people and demand high ransoms. Two of his accomplices were acquitted but Weidmann and Roger Million were convicted and sentenced to death. Million’s sentence was later commuted but at 4.50am on 17 June 1939 Weidmann was beheaded in Rue Georges Clemenceau (in front of the Palais de Justice), Versailles. The day before every vantage point overlooking the guillotine site was rented out at fantastic prices. From his cell Weidmann could hear the hammering of his guillotine being erected and the laughter of the revellers in cafés, waiting for the entertainment to begin. Even the morning drizzle didn’t dampen the enthusiasm. The executioner Henri Desfourneaux, known for being very slow at the job, entered the record books as having officiated at the last public execution in France. It was also his only performance in front of a public audience. He was very nervous. Dressed in black he set up the guillotine at 3am. Due to delays and miscalculations the decapitation took place in daylight rather than the break of dawn, which allowed photographers to take clear pictures. Weidmann was allowed a few puffs on a cigar and a mouthful of rum in his cell. The bascule, or see-saw plank to which the victim is strapped then tipped and loaded under the blade, had been badly adjusted and it took Desfourneaux three attempts to get Weidmann’s neck into the crescent shaped head-holder correctly. Ultimately the assistant executioner had to pull Weidmann forward by his hair and ears. As the blade finally dropped it was accompanied by the eerie whistling sound that is heard at beheadings. The photographs so shocked the public that, a week later, a statute was passed that all executions henceforth would be carried out in private.